Hawks head Anwa Dramat's decision last year to close the decade-long investigation led to an outcry from anticorruption campaigners and opposition parties. The apparent flimsiness of the reasoning underlying his decision is reflected in an internal memorandum, which was submitted to Dramat on September 14, a week before he pulled the plug. When shown the memo, arms deal campaigner Richard Young charged: "The president and his ministers all preach the good fight against corruption. Here are cases that are eminently winnable after having been investigated in great depth and at great cost, but clearly prosecution was not an option as they involved luminaries close to the president." Democratic Alliance MP David Maynier recently obtained the memo from the police under the Promotion of Access to Information Act. He had applied for "all documentation relating to the decision to cancel the investigations" after the Mail & Guardian revealed Dramat's decision last October. He was given no further documents. "It’s hard to believe that this poorly drafted six-page memorandum formed the basis of the decision to close the investigation into the arms deal," said Maynier. The Hawks did not respond to detailed questions, but spokesperson McIntosh Polela played down the significance of the memo to the decision. "It is merely an internal discussion document summarising the main points of concern. It obviously does not provide for various consultations that took place about the facts and the merits of the decision to close the investigation." But the question remains whether the "consultations" would have been of greater quality if the written "summary" had not been so poor. Hawks commercial crime head Hans Meiring *1 submitted the memo to Dramat to recommend closing the probe. Meiring's involvement is explained by the fact that Johan du Plooy, the veteran -- and by then only -- investigator allocated to the probe, reported to him. Du Plooy did not agree with Dramat's decision, according to third party reports. The decision closed the investigation's last two active legs, which also happened to be among the most explosive. The BAE Systems leg rested on evidence that the British arms firm had paid more than R1-billion in "commissions" to, among others, late defence minister Joe Modise's adviser, Fana Hlongwane. 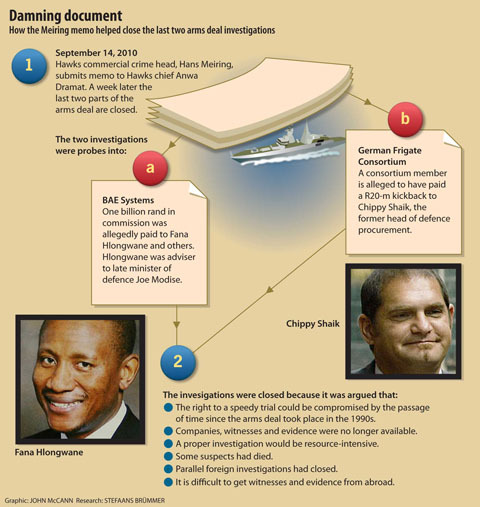 The German Frigate Consortium (GFC) leg included allegations of a R20-million kickback to Chippy Shaik, then head of defence procurement. Hlongwane remains a confidant of senior ANC leaders. 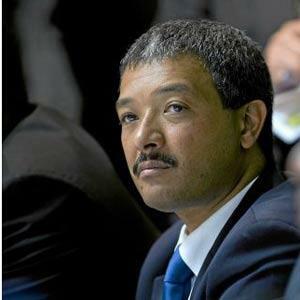 The M&G revealed last year that he financed a R4-million home for Siphiwe Nyanda, now President Jacob Zuma's parliamentary counsellor, when Nyanda retired as chief of defence in 2005. Nyanda headed the defence force when the arms contracts were signed. Chippy Shaik is the brother of Schabir, Zuma's former financial adviser, who was convicted of corruption in the arms deal. In broad strokes Meiring's memo argued that the right to a speedy trial could be compromised by the passage of time since the deal "in the mid-nineteens [sic]". It also states that companies, witnesses and evidence had disappeared, a proper investigation would be resource-intensive, suspects had already died; parallel foreign investigations had been closed; and it would be difficult to get witnesses and evidence from abroad. Meiring claims that "the three suspects in the BAE leg have all passed away". Modise, defence minister during the period of arms procurement, and Richard Charter, one of BAE's local agents, have both died, but the identity of the third suspect is a mystery. Certainly, Hlongwane -- who was regarded as a suspect because he could have influenced the deal as Modise's adviser and subsequently received more than R200-million in payments from BAE and its partners -- is alive and well. Meiring dismisses the entire GFC investigation involving Chippy Shaik in three paragraphs tacked on to the end of the document, claiming that "the reason mentioned in the BAE case is also applicable to the German Frigate Consortium case". This flies in the face of firm evidence. Shaik's alleged R20-million bribe is documented in Thyssen company memorandums obtained in raids by German investigators and informally shared with the South Africans. Thyssen is the lead company in the GFC. In one key memo Thyssen executive Christopher Hoenings recorded that Shaik "asked once again for explicit confirmation [of] the verbal agreement made with him for payment to be made in case of success, to him and a group represented by him, in the amount of $3-million". Further corroborative documentation is understood to include an instruction in which Shaik allegedly nominated accountant Ian Pierce to receive the payment. German magazine Der Spiegel reported two years ago that Merian Ltd, an offshore company represented by Pierce, received $3-million in April 2000, the same month that South Africa paid the GFC the first instalment on navy vessels ordered from it. The M&G subsequently identified at least some flow -- five payments totalling roughly R500 000 -- from Merian Ltd to a South African bank account held by Pierce. Whereas the police have now disclosed the Meiring memo to the DA's Maynier, Parliament's standing committee on public accounts, which ordered the arms probe in 2000, remains in the dark. Scopa chair Themba Godi said last week that after the news of Dramat’s decision "I did a formal letter to [the Hawks] and they did not bother to respond". Godi later contacted police national commissioner Bheki Cele, who said he would "talk to them", but still got no response *2. Maynier said he would hand a copy of the memo to Godi so that Scopa could probe Dramat's decision. With acknowledgements to Stefaans Brummer and Mail and Guardian. *1 In the normal course - General for No Good Reason. In the New South Africa - General for All The Right Reasons. His memo is one long non sequitur. Meanwhile Whipper Snapper Dramat is just an old MK mate of Moe, Chippy et al. *2 So he left it at that.